On the right, a more detailed list allows players to record what happened during each scenario, indicating which Guild earned each Achievement (who collected the most coins, whose Heroes died the least, etc). 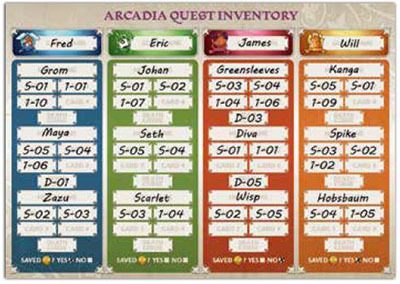 The reverse side of the Campaign Sheet is used to keep track of the Guilds, indicating which Heroes each player chose and what are their current Upgrade cards and Death Curses. During a campaign, after a scenario is finished (but before its Upgrade Phase), players will make a record of what they have just played. If it is their first scenario, they will also make a record of the Guilds they have created, indicating which three Heroes they chose for the campaign. The record-keeping starts with indicating which scenario was just played. This is done on the map of Arcadia on the front side of the sheet, where players will indicate which scenario they have just played and mark it with its number according to the order in which it was played in the campaign (1 through 6). Winner: Indicates which Guild was the first to complete the Quests necessary to win the scenario. Least Deaths: Shows which Guild accumulated the least amount of Death tokens among its Heroes. Most Coins: Indicates which Guild won the most coins during the scenario (before spending them during the Upgrade Phase). Won Reward: Registers which Guild completed the Quest with a Reward card associated with it and, consequently, won the Reward card. Won Title: Marks which Guild acquired a Title by completing the Quest associated with it. If two or more Guilds are tied for an Achievement, all of the tied Guilds are considered to have earned it. After players execute the Upgrade Phase for the scenario that has just been played, the next step is to turn the Campaign Sheet over and update the Guild Inventories. Players will write down the cards each Guild possesses at this point (using the card codes) and any Death Curses that each Hero might carry. Note that the players will not just record the new cards they have purchased, but all the cards currently in possession of his Guild's Heroes after the Upgrade Phase. If a player has saved a coin to spend in a future Upgrade Phase, he notes it in the Campaign Sheet. Once the 6th and last scenario of the campaign, the Final Showdown, has been played, Arcadia has finally been liberated! The Guild that wins the last scenario is the victor, and gets all the power and glory that comes from control over Arcadia! However, your actions throughout the campaign will determine how much control you actually have over Arcadia once it is retaken. For each of the Achievements listed in the Campaign Sheet, a Guild will be awarded a specific Medal. Tally up the Achievements of the entire campaign, and determine which Guild won each Achievement type the most times. That Guild is then awarded the Medal associated with that Achievement type. If more than one Guild is tied with the most wins in an Achievement, all tied Guilds win the associated Medal. The amount of Medals each Guild won determines how much prestige it has in the retaken city. You Guild's weak role in the campaign to retake Arcadia did not convince your rivals of your right to rule. Your hold is contested and troublesome. Fights are constant in the streets and your Guild has to keep an eye out for usurpers! Your Guild has subdued its rivals and the ascent to power is ensured. The rival Guilds share a hold over certain aspects of the city, but (at least for the time being) they respect you as the dominant Guild, triumphant in the eyes of the Arcadians. Your Guild has truly shown its valor and established dominance over almost all aspects of the city. The bards in the city sing songs of your deeds and your rule will live in the Arcadian minds as a glorious memory long after it is gone!. 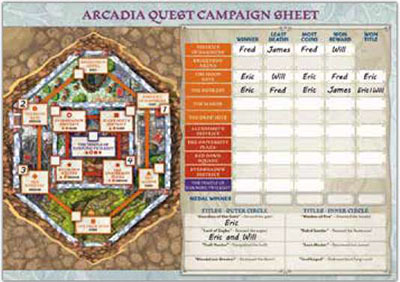 Arcadia Quest is intended as a campaign game, with the scenarios being played from the beginning in the Outer Circle all the way to the Final Showdown at the heart of the city, with your accomplishments in one scenario affecting the game in the next, and with your group of heroes becoming gradually more and more powerful. 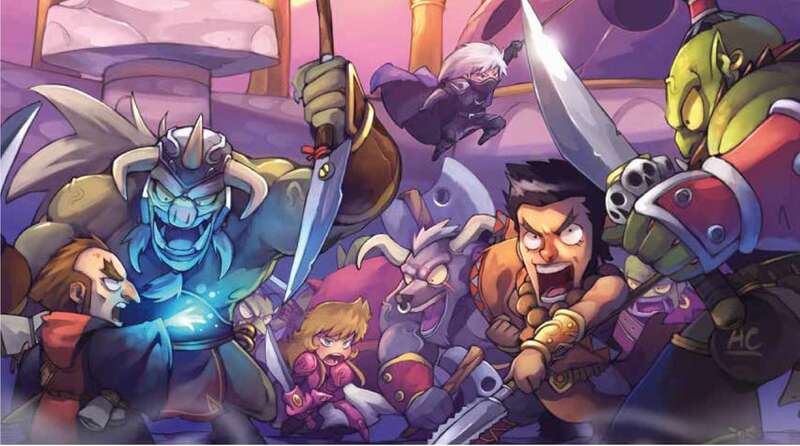 However, if a group of players desires to simply have some fun in a disconnected way, just gathering some Heroes and playing a scenario without greater repercussions, they can play in Episodic Mode. This is done in the normal way, as de- tailed on page 7. 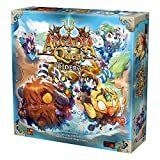 Each player picks a Guild color, the Heroes are picked so each Guild ends up with three, and the starting equipment from the Starter deck is dealt normally. The players should decide together at what level they would like to play this game, from level 1 to level 6. The higher the level, the stronger the Monsters will be, but players will have access to more Upgrade cards. For each level beyond 1, the players are dealt Upgrade cards from all previous levels. So if playing at level 2, only the Level 1 deck will be dealt; at level 3 - decks Level 1 and 2; at level 4 - decks Level 1, 2 and 3; and so on. Starting with the Level 1 deck, each player is randomly dealt 6 cards from the deck, from which he may keep only 2, discarding the rest. The cards are not purchased with coins, the players simply choose which ones to keep. This is repeated for all the decks accessed, according to the game level. If at the end the players have more than 12 Upgrade cards, they must discard the exceeding number. Any scenario in the Campaign Book can be played in this mode, just be sure to use the Monster cards at the level that has been chosen by the group. Alternatively, you may want to create your very own scenarios, using the modular game tiles and coming up with custom Quests! Lose 1 coin for each Death Token in your Guild. The Guild that finishes the Scenario (by completing three Quests) gets an extra 5 coins. Each Guild adds together all its coins, and the one with the largest amount is the winner.